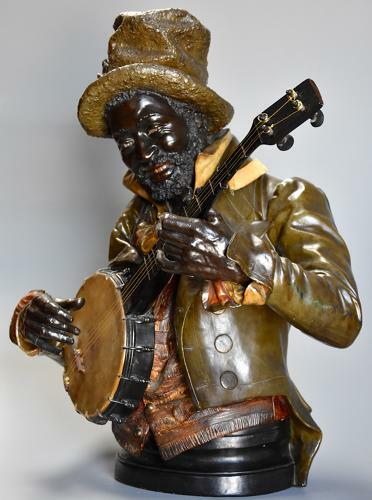 This polychrome terracotta figure depicts a Minstrel happily playing his banjo dressed in a hat, jacket and waistcoat. An original bronze of this figure by Pietro Calvi can be found in 'The Montauk Club' in Brooklyn, New York. Pietro Calvi was born in Milan in Italy in 1833 and was an eminent ethnographic sculptor, many of his works reflecting his fascination with the Orient and beyond. This figure is in very good condition for age with evidence of a couple of old repairs, is of stable construction and can go straight into a home.